All BlackBerry PlayBook models sell for $299 | BlackBerry Blast! 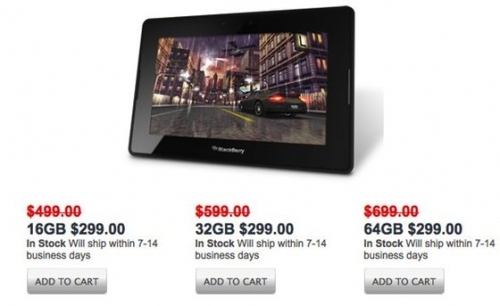 RIM is apparently offering all of their BlackBerry PlayBook models for $299 on the company's website. That means that no matter what size you get (16GB, 32GB, 64GB), the price is the same. This is an aggressive sale, but who would opt for the 16GB model? The expiration date for this sale appears to be 2-4-2012 so you still have time to pick one up. With the recent news that the PlayBook can now run Android apps, this is a great deal for a 64GB tablet.